Okay, you got me. This isn't linguine. It's cappellini. I'm still shocked that when I went to my pantry to grab a box of linguine, there wasn't one there. It's like going to the pantry and not finding a can of crushed tomatoes, garbanzo beans, or ketchup. Someone is not doing her job of overstocking at the local Big Box store. 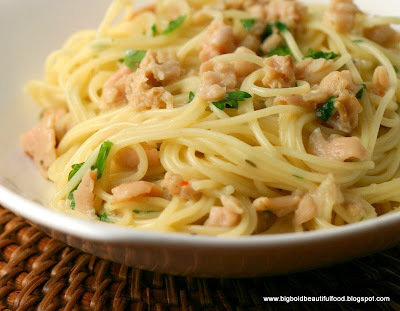 Anyhow, nothing beats linguine and clam sauce for a quick weeknight dinner. You just need a few staple ingredients: canned chopped clams, linguine (hopefully), olive oil, garlic, salt and red pepper flakes. A glug of dry white wine, fresh chopped parsley, and a squirt of lemon would be nice. Yes, you heard me right. Sour cream. A couple spoonfuls of sour cream at the end to finish the sauce gives it body and a little tang. Heat a large pot of water to a boil. Add a generous amount of salt. Cook pasta as directed on the box but cook one minute less so that it's a little underdone, just shy of al dente. Drain. While the pasta is cooking, heat a 10 inch or 12 inch skillet over medium heat. When hot, add olive oil. Swirl around and add minced garlic. Saute for 1/2 minute and add clam juice, some Italian seasoning, and red pepper flakes. If you have white wine or Vermouth, add a glug. Turn up the heat and let the juice simmer down by half. Add chopped clams. Add drained pasta and let pasta simmer gently in sauce a couple minutes until al dente. Sprinkle generously with parsley and add a couple spoonfuls of sour cream (add 1 first if you're not sure you'll like the taste). Squirt a little lemon juice on the pasta. Stir everything all together. Season to taste. Can't wait to make it.... may try greek lo fat yogurt instead- will get back to you! Wow I never thought to make it with sour cream. Gotta try it. Brill. E. Ant. Never thought of sour cream and clams!! this is my favorite! thanks for sharing. i love this recipe. thanks again and God bless! I just made this recipe and it is a keeper! My 11 year old son loved it so much he proclaimed me his favorite dad. I used 9 oz of DeCecco spaghetti (what I had on hand), and two 6.5 oz cans of Bar Harbor Whole Maine Cherrystone Clams (chopped them myself). The sour cream is brilliant! Thank you for such a great, simple recipe.